Honduran Coffee Farmer David Lopez recently visited Crimson Cup Coffee Houses in Columbus, Ohio as part of Crimson Cup's "Meet the Farmer" series. Lopez also visited the Ohio State University and Upper Arlington's Barrington Elementary School, where he accepted a donation of computers and projects equipped with English-language teaching tools for his community's elementary school. Through our Friend2Farmer direct trade program, we’ve been working with David and the village of El Socorro to improve the quality of their coffee and achieve community goals. Ohio coffee roaster Crimson Cup Coffee & Tea recently welcomed Honduran Coffee Famer David Lopez to its “Meet the Farmer” series at its Innovation Lab and local Crimson Cup Coffee Houses. During his Columbus trip, he also visited with students at the Connecting Grounds coffee house on the Ohio State University campus and at Upper Arlington’s Barrington Elementary School. Before leaving, he accepted a donation of computers and projectors equipped with English tutorials for students in his native village of El Socorro de la Penitas. During appearances at the Crimson Cup Innovation Lab and coffee houses, Lopez presented samples of his micro-lot coffee, which is grown from catuai varietals at an elevation of 5,250 feet. Lightly roasted, this washed and patio sun-dried coffee has a syrupy body with caramel and brown sugar notes. Lopez’s micro-lot is available at the Connecting Grounds coffee house on the Ohio State campus and is among the featured coffee in rotation at Crimson Cup Coffee Houses. It can also be purchased via the Crimson Cup website. Lopez made a special visit to Barrington Elementary School to meet with fifth grade students who recently studied different trade models for goods imported into the U.S. They learned about the direct trade model Crimson Cup has established with El Socorro farmers. At the end of the presentation, Crimson Cup and the Barrington students presented Lopez with tools to help children at El Socorro’s Jose Cecilio del Valle elementary school develop the English-speaking skills they need to pursue education beyond the sixth grade. 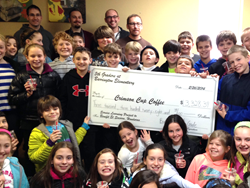 An earlier class of Barrington students had raised $3,328, which was used to purchase two laptop computers and three wireless projectors. Ohio State students are in the process of translating teaching materials that can be downloaded to the laptops to aid El Socorro teachers in English instruction. Through its Friend2Farmer direct trade program, Crimson Cup conducts annual service trips to Honduras with a group of students to support Lopez’s efforts. The company developed Friend2Farmer to ensure that farmers receive a fair share of proceeds from coffee sales. It pays an above-market premium to farmers, who can then invest in agricultural and community improvements. Crimson Cup coffee experts also collaborate with farmers on ways to improve the quality of the coffee and quality of life for farmers, workers and their communities. Roast magazine editors cited the roaster’s work in cultivating relationships with coffee growers around the world as a factor in naming Crimson Cup its 2016 Macro Roaster of the Year. Columbus, Ohio coffee roaster Crimson Cup Coffee & Tea is Roast magazine’s 2016 Macro Roaster of the Year. Since 1991, Crimson Cup has roasted sustainably sourced specialty and craft coffee in small batches. The company also teaches entrepreneurs to run successful coffee houses through its coffee franchise alternative program, which includes a coffee shop business plan. Crimson Cup coffee is available through a community of more than 350 independent coffee houses, grocers, colleges and universities, restaurants and food service operations across 29 states, Guam and Bangladesh, as well as the company’s own Crimson Cup Coffee Houses. To learn more, visit crimsoncup.com.